Nothing makes an event memorable like great food served in a warm, cozy atmosphere. If you want to experience the best of fine dining in an Italian restaurant in Beaver Dam, Benvenuto’s Italian Grill is the place to be. Our Italian restaurant in Beaver Dam has an original, diverse menu that matches a wide variety of palates and preferences. Dine at our Italian restaurant in Beaver Dam today—you'll be delighted you did and perhaps even come back for seconds! Through the years, we've become the favorite Italian restaurant in Beaver Dam of many Wisconsin locals. This is the result of our commitment to uncompromising quality of food, service, and people. Because our customers' satisfaction is of paramount importance to us, we do everything possible to make their experience at our Italian restaurant in Beaver Dam one worth recalling. At our Italian restaurant in Beaver Dam, we take pride in catering to families while retaining our signature casually elegant ambiance. The doors of our Italian restaurant in Beaver Dam are open to children, and we make sure that the time they spend with us is enjoyable on their end. This is why we don't get in the way of their unleashing their energy and talents. For great memories that last a lifetime at a family-friendly Italian restaurant in Beaver Dam, come dine at Benvenuto’s Italian Grill. We're known to successfully combine elegance and comfort into exceptional Italian fine dining at our Italian restaurant in Beaver Dam. Benvenuto’s Italian Grill is a locally-owned-and-operated Italian restaurant in Beaver Dam, where food is made from the freshest, finest ingredients. We make a tremendous effort to source only local, all-natural products so that the unmatched quality of our dishes is maintained. In doing so, we're able to steer away from additives and preservatives to the best of our ability. 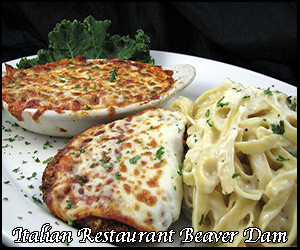 We want every Wisconsin local to enjoy the food at our Italian restaurant in Beaver Dam. To make this happen, we created a menu that can accommodate guests with dietary restrictions, preferred diets, and allergy concerns. Gluten-free and low-gluten meals, as well as low-carb and meatless dishes, are served at our Italian restaurant in Beaver Dam. These include pasta, pizza, sandwiches, and entrees, which are all approved by the Gluten Intolerance Group® and by a licensed Wisconsin dietitian. Whether you need a place to host formal dinner, a corporate function, or any other special event, Benvenuto’s Italian Grill is just the Italian restaurant in Beaver Dam for you. The layout of our Italian restaurant in Beaver Dam is designed to accommodate a wide array of occasions. With our Italian restaurant in Beaver Dam as your venue, you can have peace of mind knowing only top-quality food and service will be offered at your party. We welcome go-to orders not only for individuals and families but also large groups. Our Italian restaurant in Beaver Dam has special menus for groups of 10 or more, whether you’ll hold your event at our dining location or take your order to go. If you came to Wisconsin for the good food and wonderful times, our Italian restaurant in Beaver Dam is sure not to disappoint. Benvenuto’s Italian Grill is the go-to Italian restaurant of Beaver Dam locals and tourists. Dine with us today. We also have special menus for groups of 10 or more, whether you host your event at our restaurant or order your meals to-go. For more information on our policy on large groups and parties, contact the restaurant location near you. Click here to learn more about our accommodations for groups and parties.